You’ll receive an overwhelmingly warm welcome at Red Flower Cottage Homestay, and you can expect that hospitality throughout your stay from Ms Kim. Situated a hop and a skip to the An Bang Beach and all its bars and restaurants, Red Flower has five comfortable cottages that will please mid-range seekers or flashpackers willing to splurge. Each cottage is spacious, with high ceilings, polished concrete floors, wooden furniture and large windows -- you’re close enough to the water that you can actually catch a sea breeze. Bathrooms are modern-meets-beach, with floor, walls, vanity and sink constructed with slate-grey polished concrete, the design softened with rustic bamboo accessories. The hot water shower has two showerheads. This is definitely not a weathered beach shack; guests also get a fridge, flatscreen TV, WiFi and air-con. The largest cottage includes a kitchen and living area. The property itself doesn’t have much space and the garden is tiny. In any case, you’ll probably spend more of your outdoor-time on your bungalow’s shaded terrace. Ms Kim is lovely and she goes out of her way to ensure guests are comfortable. Her English is excellent and the room rate includes breakfast and bicycle. This is a great pick for An Bang. Red Flower Cottage Homestay is easy to find. There’s a sign above their entrance way which is directly on the An Bang village road. As you approach the An Bang main parking area, head left on the paved road behind the beach. 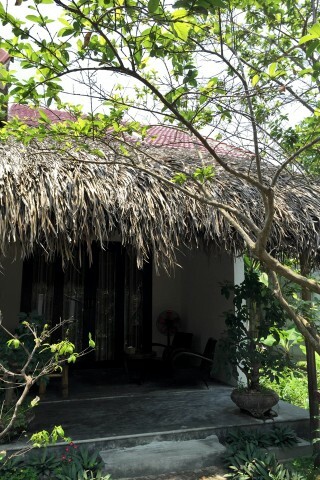 Check rates at Red Flower Cottage Homestay on Booking.com.